Tracker Software Products :: PDF-XChange PRO - World's best PDF creation and manipulation Tool. All the features of PDF-XChange Standard Printer + PDF-Tools + PDF-XChange Editor Plus, included in one economical bundle. PDF-Tools is a worldwide leader in the creation and manipulation of PDF and image files. Highly user-friendly, it can be used to convert files of almost any format to/from PDF. Avail of sixty-six built-in standard tools, as well as functionality to clone and edit these tools and their variables as you desire. Use the Actions Library to fully customize your tools and the Tool Actions Sequence to determine the order in which they perform operations. Combine seventy-three available actions to create your own tools - out of billions of possibilities. PDF-Tools is compatible with large PDF files and can also handle a huge number of files simultaneously – batch conversion is its strength. PDF-XChange Standard Printer is Tracker Software’s best-selling virtual printer - the ultimate application for the creation and virtual printing of industry-standard PDF files. It’s compatible with files from almost all Windows applications, such as Word, Excel and AutoCAD, and features an optimized engine for superb conversion of images and image-based text characters. The files it creates are surprisingly small, given their quality – allowing for faster uploads/downloads, a reduction in storage space and increased data retention - even at high levels of compression. PDF-XChange Standard also features MS Office integration, which provides extra functionality such as adding clickable tables of contents and embedded URL support that facilitates the creation of external links. The Enhanced OCR plugin is now available as an optional extra in PDF-XChange PRO. It is more accurate, dynamic and faster than the default OCR engine, and contains a range of extra features. Further information on this plugin is available here. 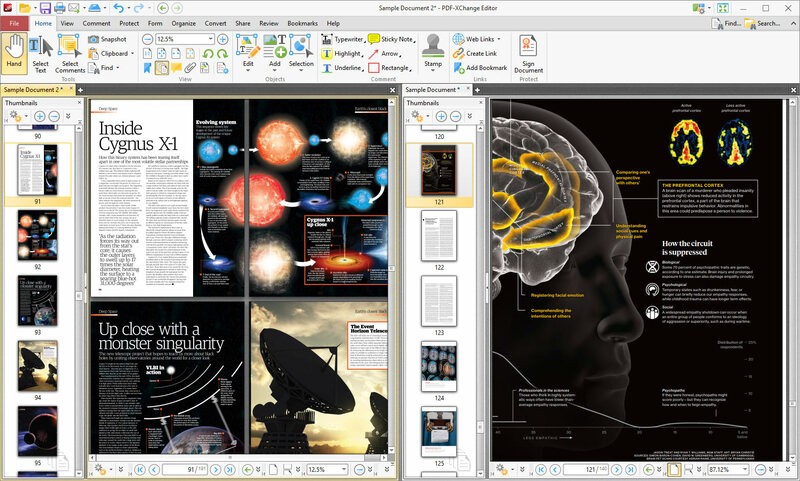 PDF-XChange Editor Plus is a hugely dynamic and fully-customizable PDF application. Create, view, edit, annotate, OCR and sign PDF files – and that’s just the beginning. If you work with PDF then this fully-customizable product will optimize your work process to levels that no other product can achieve. Create PDF files from scanned documents, images, text files, Markdown files and much more. Convert Microsoft Office documents to PDF at the click of a button. Avail of over thirty tools to assist in the creation of document comments, annotations, links and fillable forms. These tools make editing PDFs a finely-tuned, precise process that produces documentation and image files of the highest quality. Our user-friendly functionality is diverse enough to meet the needs of all practitioners from novice users to professionals. PDF-Tools is a worldwide leader in the creation and manipulation of PDF and image files. Highly user-friendly, it can be used to convert files of almost any format to/from PDF. Avail of sixty-five built-in default tools, as well as functionality to clone and edit these tools and their variables as you desire. Use the Actions Library to fully customize your tools and the Tool Actions Sequence to determine the order in which they perform operations. Combine sixty-nine available actions to create your own tools - out of billions of possibilities. PDF-Tools is compatible with large PDF files and can also handle a huge number of files simultaneously – batch conversion is its strength. PDF-XChange Standard is Tracker Software’s best-selling virtual printer - the ultimate application for the updating and conversion of documents to industry-standard PDF files. It’s compatible with files from almost all Windows applications, such as Word, Excel and AutoCAD, and features an optimized, hybrid conversion engine that prints to both GDI and XPS. The files it creates are surprisingly small, given their quality – allowing for faster uploads/downloads, a reduction in storage space and increased data retention - even at high levels of compression. PDF-XChange Standard also features MS Office integration, which provides extra functionality such as adding clickable tables of contents and embedded URL support that facilitates the creation of external links. The Enhanced OCR plugin is now available as an optional extra in PDF-XChange PRO. It is more accurate, dynamic and faster than the default OCR engine in PDF-XChange Editor and PDF-Tools, and contains a range of extra features. Further information on this plugin is available here. Use PDF-XChange Editor to edit the base content of documents. Use the Edit Content tool to select and edit base content, and avail of a range of dynamic editing options for images and text. PDF-XChange Editior features a range of functionality for the manipulation of comments, including features to Summarize, Flatten or Export Comments as desired. Create, print and email documents. Use Sharepoint, Dropbox, Google Drive and/or MS Office 365 integration to open documents directly from 'the cloud' and then use PDF-XChange Editor functionality to convert them to/from PDF. Combine PDFs into a new document. Create PDF documents directly from scanned material. Use the OCR engine to make image-based/scanned text searchable and selectable. Available in multiple languages. The OCR process identifies text in documents and uses it to create an invisible text layer that is placed on top of existing document text. Convert a wide range of industry-standard file formats, including MS Word, Excel and Powerpoint files, to/from PDF. Note that PDF files converted to MS Word format are compatible with MS Word 2010 and later. Use the Digital Signatures feature to add hugely customizable digital signatures to documents. Use the language options to convert the UI language into your language of choice. English, Spanish, German, French and many more are available by default. 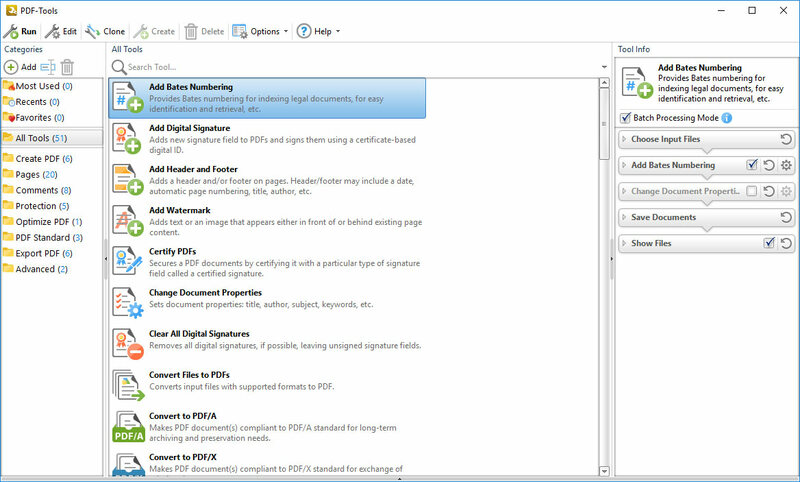 PDF-XChange Editor contains over a hundred features in addition to those listed above. See here for further information. PDF-Tools features sixty-six default tools that can be used to perform a huge range of customizable operations. Create and edit PDF documents and document comments, secure files, convert files, export files to different formats - and much more. Use the diverse Actions Library to create your own tools and meet highly-specific requirements. See below for an outline of available actions. Create PDF files from all industry-standard formats, image files, scanned material or text files. Extract pages from multiple sources into new PDF documents. Crop, OCR, optimize, overlay, resize, rotate, insert, replace and/or delete document pages. Use the Comments tools to create/delete weblinks, delete/flatten/summarize comments, and/or delete form fields, links and markup annotations as desired. Use the Protection tools to secure documents. Utilize certificate-based digital IDs to add and sign signature fields, add timestamps to verify document content, use certified signature fields to certify documents, add customizable password security to documents and/or clear existing digital signature fields. Use the PDF-Standard and Advanced tools to change document properties, email documents, convert to PDF/A or PDF/X format and/or discard special PDF-standard information such as PDF/X, PDF/A and PDF/E compliance data. Export PDF files to image files, plain text (*.txt) format, MS Excel Spreadsheet (*.xlsx) format, MS Powerpoint Presentation (*.pptx) format or MS Word (*.docx) format. Use the Extract Images from PDF tool to locate and extract images from PDF files. Please note that source files must be text-based in order to be converted into editable text. PDFs converted to MS Word format are compatible with MS Word 2010 and later. Use the Split/Merge PDFs feature to combine input documents into a single PDF file or break single documents down into multiple files. Use a scanner to create PDF documents directly from scanned paper documents. Use the Save As Optimized feature to optimize documents and reduce their file size as they are saved. Use the dynamic and customizable Folder Monitor feature to set up folder monitoring and automatically perform tool operations on files that are moved into designated folders. Use the Tool Report feature to view a step-by-step breakdown of the processes involved when tools run. Use the Export/Import Tools features to export/import customized tools to/from file. Use the Change Document Properties feature to create/edit document properties such as the document Title, Author, Subject, Keywords and Creator. Note that Macros can be used in conjunction with this tool. Convert raster image files into PDF. Customize page dimensions, images layout options, image labels and processing/compression options as desired. PDF-Tools features a huge range of additional features and functionality. See here for further information. PDF-XChange Standard has been re-engineered and now features a faster, highly optimized hybrid conversion engine that prints to both GDI and XPS. Driver Mode Rules have also been introduced, which enable the designation of GPI/XPS printing for specific printing applications as desired. Avail of flexible output options, utilize batch conversion to convert multiple files simultanesouly, create Watched Directories to enable the automatic conversion to PDF of MS Office documents moved to specific locations to PDF and much more - see below for an extensive list of available features and functionality. Use Watermarks, Auto Bookmark Generation, Headers and Footers and Link Settings to update PDF files. Use the Graphics settings to determine the resolution (DPI) for document images, or convert them into different image formats. Avail of Linear, Bilinear or Bicubic downsamplling options, and set conversion options as desired. PDF-XChange Standard supports Chinese, Japanese and Korean fonts and character sets. Enjoy a huge range of additional features and functionailty in PDF-XChange Standard. See here for further information. 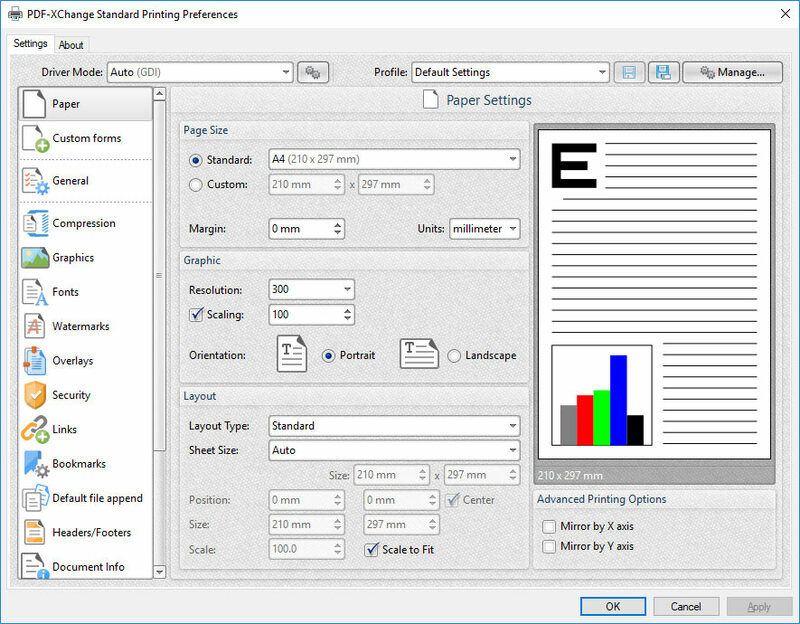 PDF-XChange Editor Plus is a hugely dynamic and fully-customizable PDF application. Create, view, edit, annotate, OCR and sign PDF files – and that’s just the beginning. If you work with PDF then this fully-customizable product will optimize your work process to levels that no other product can achieve. Editor Plus includes all the features of the Editor plus the ability to Create/Edit PDF fillable forms and dynamic stamps. PDF-Tools is a worldwide leader in the creation and manipulation of PDF and image files. Highly user-friendly, it can be used to convert files of almost any format to/from PDF. Avail of fifty-one built-in standard tools, as well as functionality to clone and edit these tools and their variables as you desire. PDF-XChange Standard is Tracker Software’s best-selling virtual printer - the ultimate application for the updating and conversion of documents into industry-standard PDF files. Additionally, we guarantee that none of our evaluation products require registration, and neither do they contain Spyware, Adware or any other invasive content. Additionally, all of our products are very simple to fully uninstall via the the 'Add/Remove Software' option of the Windows Control Panel. Intended for System Administrators we offer 32 and 64 bit MSI installers for network installations of PDF-XChange PRO. I appreciate it very much, I am already used to the layout. This my third version bought. I use it in two machines for high academic purpose. Like: clearly arranged, fast, does almost all things I need Minor dislike: Did not manage, to remove underlining in the same manner as "highlightning" e.g. yellow; but I do underline too often, so, not so important for me.